A Low Cost Six Night Walking Holiday on the Llŷn Coastal Path, making partial use of your own car. Arrive at the Llys Olwen Guest House in Morfa Nefyn. 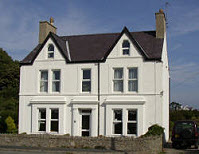 This is a friendly family run B&B where you will be given a warm Welsh welcome for your stay of three nights. The rooms here are not en suite. You are only a short walk from a beautiful beach and there are a number of interesting pubs and restaurants in the area for your evening meal. After breakfast we will ask you to follow us in your own car, parking at the end point of the day’s walk in Llithfaen. We take you on in our minibus to the start of the walk at Clynnog Fawr church. This was the traditional assembly point for medieval pilgrims making the journey to Bardsey Island whose footsteps you follow. The first section of the walk takes you over high moors at Bwlch Mawr and on to the Rivals Inn at Llanaelhaearn (lunch option) and then up an interesting ascent of the Yr Eifl range spectacular Iron Age fort of Tre’r Ceiri and back to your car at Llithfaen. 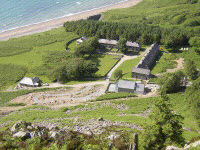 We take you back to Llithfaen to follow the Llŷn Coastal Path route, including the Nant Gwrtheyrn Heritage Centre, the town of Nefyn and the famous Ty Coch pub on the beach at Porth Dinllaen before walking back to the Guest House. You walk directly from the guest house to meet up with the coastal path following this south-west along the coast until you reach Porth Towyn heading inland until you reach Tudweiliog where you can stop for lunch at the Lion Hotel. You can then catch the local bus back to Morfa Nefyn to pick up your car so that you can drive to your new accommodation at Dolfor 2 in Aberdaron. This is a small, friendly B&B right next door to our office. Aberdaron has lots of good places to eat, such as the award winning Ship Hotel. Distance: 8 miles or more if you wish. After breakfast park your car at the National Trust Car Park at Porth Oer (Whisting Sands) and we will take you on to Porth Towyn from where you can follow the path along rocky coves and sandy beaches to your car. Walk to Porth Meudwy not far from Aberdaron and take the Enlli ferry across to Bardsey Island . This is a beautiful place, full of wildlife and steeped in history. Visitors have three hours to explore before returning to the mainland. The cost is £30 per head. You will return circa 3:30pm and can then set off for home. Alternatively there are beautiful walks along the south coast, the National Trust house Plas yn Rhiw, or the delights of Snowdonia to visit. These prices include B&B accommodation over 6 nights, minibus transport and use of the maps and GPS and care and attention throughout. Supplement for single occupancy of a room as a member of a larger party will be £20 per night. The supplement for solo travellers will be £30 per night. We may book similar accommodation of equivalent standard if the above establishments are unavailable. For more information, or if you would like to book, please telephone us on 01758 760652.